I knew I was screwed when you were sat in my station at around 6:15 last night. The bottle of wine that you brought in, a bottle that would cost around $300 on our wine list if we offered that year of that vintner, was the first tip off. The second was your first comment to me – “We are going to be here for a long time” was the second. The third was your demeanor. I think the word would be “dour”. Now, how could a couple celebrating their shared birthday be so sullen? I really don’t know. However, I shifted into a mindset that refused to share this sullenness and gave in to the idea that they didn’t want to be rushed. I probably heard it three times that “We’re in no hurry”. So I played to that. I asked them when I should bring their appetizer. They told me, “In around 10 minutes. She wants to finish her sherry first”. Cool. So that’s what I did. I didn’t even take the rest of their order until after their appetizer was finished (dismembering each of the 4 shrimp took her about 5 minutes – I didn’t know you could cut them into such small bites). When I took their entree order, I asked them, “Should I wait to bring their salads”? they said, “You can bring them whenever you want; we’re in no hurry”. “Does that mean that you want me to wait a few minutes”? “No, you can bring them now if you want”. Of course, it took them around 20 minutes to eat their salads. That was fine – I was resigned to dragging this sad excuse for “celebration” out. I didn’t have anything else really going on anyway. I carefully metered their wine from the decanter that I had provided for them, making sure that they didn’t run out early. This meant watching the levels in their glasses so that I only poured a tiny bit of wine just before they were finished. this was the only way I could make the wine stretch for almost 3 hours. When I cleared their salads, I told them, “Once I call for your entrees, it will take about 5 minutes. Would you like me to wait”? “No, you can bring them out”. So I called for the entrees and sure enough, about 5 minutes later, I brought their perfectly cooked steaks out for them. “That was fast”. I let that little bit of passive-aggressive slip go right by. When I cleared their entrees, I asked them if they wanted to see the dessert menu (I already suspected the answer, because this was a ploy for me to surprise them with a free birthday dessert). “No,” he said, “we’re full”. So, around 10 minutes later, I brought out the free dessert, complete with candle. She ate most of it and then asked me to box up the miniscule portion left. No problem; that’s exactly what I did. It was now around 9:15. When I presented the bill, he pulled out a free entree coupon. 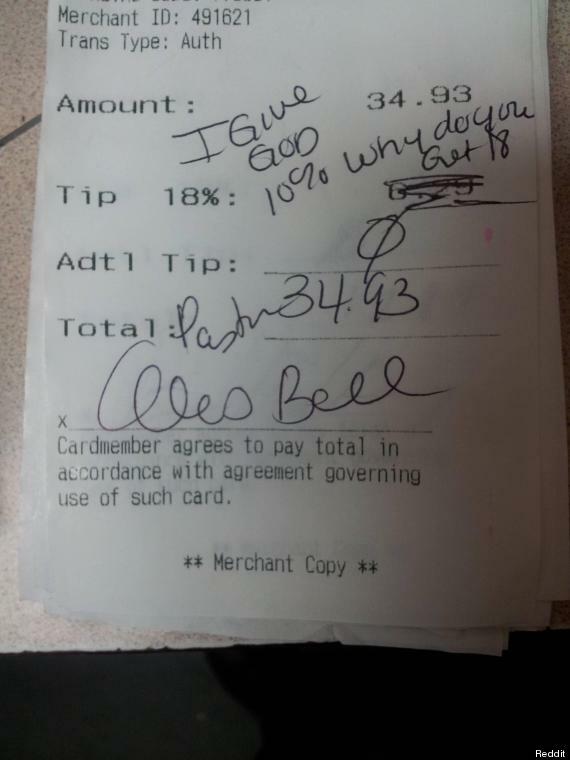 Their bill was $160 after taking off the dessert and the entree. The original amount would have been around $220, not counting the free dessert, which I wrote on the bill and the credit card slips. Why was I not surprised then when I got to close out the credit card transaction for a $25 tip? I checked the percentage and it was 16% of the pre-tax total on the new amount. They probably thought that this was an appropriate tip for outstanding and patient service for their 3 1/2 hour meal (they left at 9:45). Now, why wasn’t this an appropriate tip? Let’s look more closely at this. They took up my table for almost 4 hours. They brought their own expensive wine, which I carefully decanted and served, paying particular attention to always having just the right amount of wine in the glass. They got a free entree and a free appetizer. These are all things that a reasonable person would compensate for. Hell, at least leave 20% on the pre-tax total to send the message that service was top-notch. But even that mediocre response to being catered to hand-and-foot would have been somewhat of an insult. Here’s the deal – if you get a free entree or complimentary food, service isn’t included, so you should tip on that unpaid amount. If you bring in a bottle of wine, you should, at the bare minimum, up your tip. Real wine people, the kind that buy bottles of boutique California cabernets with 9 years of age, tip on the amount that it would have cost them had they ordered it off of the menu. I know, because I’ve served most of the serious wine collectors and drinkers in this town. But I would appreciate just an extra $10 tip for the service for that $300 bottle. That’s the least that they could do. These folks will be back, of that I am sure (they are in our reservation system as being semi-regulars). I have their name and should I wait on them again, they are going to get the type of service that they pay for. No caring about the pacing of their meal. I won’t be asking them how they want to be served. I will provide the kind of service that will be robot-like and just speedy enough for them not to be able to accuse me of “rushing them”. I know exactly how to serve them so that they are a minimum distraction to me or my other guests. In other words, I will revert to being an order taker for them. They are, what’s called in the retail business, a loss leader.